What if you've seen it but would like to forget the whole thing? There seemed to be something missing from the whole thing. Maybe... joy? Thank you. I already saw that movie when it was called "Analysis This." Now, how about Group Therapy for the Heroes?? I'm with eglennb. I came home feeling, "that was it?" Even Eddie Murphy, who does excellent voice over work, couldn't keep it moving. It was terribly disappointing. Nothing like sitting next to kid, in a funny movie aimed at kids, and not hearing a single laugh. Denby put it best: "Shrek" teaches kids to mock before they've felt awe. Not a good plan. In the last two weekends, I've taken up about five hours of my less-than-copious spare time — that I will never, ever get back — watching the tedious current installments of the Pirates of the Caribbean and Shrek franchises with multiple eleven year olds. Reminded me a little bit of being a kid and trying very hard to be sad when ET died because all the reviews said I was supposed to. Tedious. Very, very loud, and very tedious. Although it did make me very happy for a few seconds that the wicked witch was singing I've Never Been to Me. Our kids had odd reviews of Shrek the Third. They liked it, but they said it wasn't funny. They seemed to appreciate all of the allusions, but that's about as far as it went for them: a series of clever allusions. You can get that from a grad student seminar. Though I suppose you would miss the popcorn and sodas. Speaking for myself, I missed the string of well incorporated, though actually mediocre, pop songs that became the Shrek hallmark. The shrek is dead. Long live the shrek. Shrek has left the building. I found it disappointing, even boring, also. But there was something successful in it for my son, 9, who is small for his age and this year in particular has been mercilessly picked on. I am always giving him pep talks but his self-esteem has taken a beating. 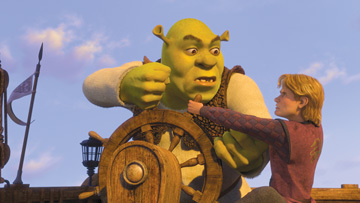 During one scene, Shrek tells Artie that it doesn't matter that people call you a loser, what matters it how you feel about yourself. During this, I noticed my son turn and look at me, almost in amazement that something Mom said could wind up in a movie. It happened again later in the movie, when Artie does his group therapy thing and tells folks the same message. My son gave me the same look again. So I guess... not a total loss. Mom isn't completely out in the wilderness on this one.